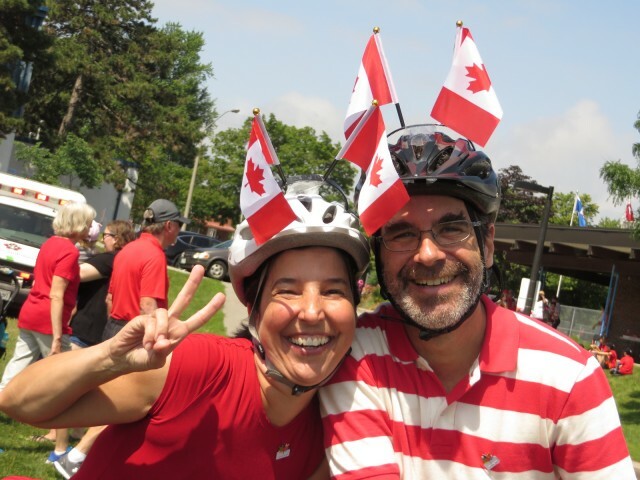 You think about joining us for the East York Canada Day parade every year, and this year you’re actually going to do it! This is our eighth year and you’re out of excuses! 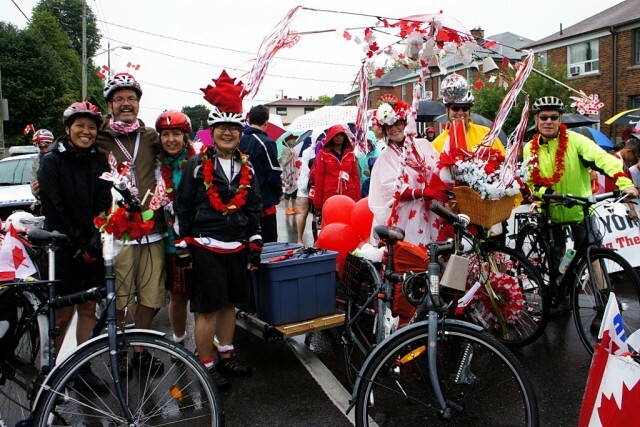 From modest beginnings in 2010 (we’re not entirely convinced that the parade actually existed before we started riding in it), the East York Canada Day parade has become the most fun cycling event of the year. Oh sure, there are bands and floats and community groups and thousands of spectators sitting along the route, but we all know that the parade is really all about having fun and looking silly on our bikes. Who will win the costume competition this year? Felicity is the three-time defending champion, but the rumour mill is abuzz with news that Val has a secret weapon this year. Is there another candidate who can beat them both? Don’t miss the next exciting chapter in this once-a-year serial thriller! 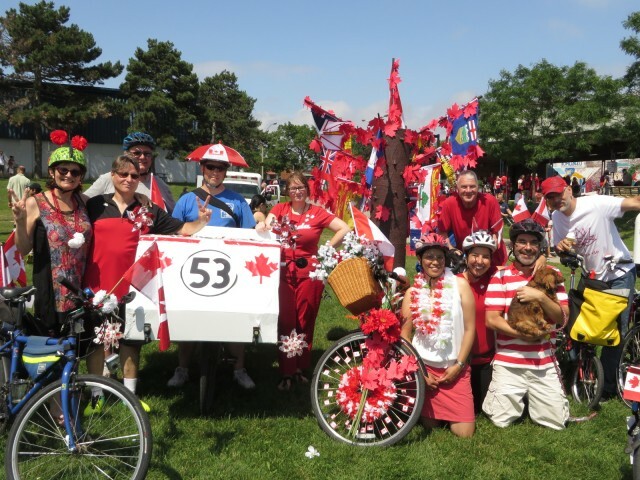 We meet on the north side of Dieppe Park (on Cosburn just east of Greenwood) at 9 am on July 1 for bike decorating; the parade leaves the park at 10 am. Be there! When: Saturday, July 1, 2017. Decorating begins at 9 am, parade leaves at 10 am, arrives at Stan Wadlow Park around 11 am. Where: Meet on the north side of Dieppe Park (on Cosburn just east of Greenwood). You won’t be able to miss us. Who: You! This is a family friendly event. The streets are closed to traffic for the parade and cyclists of all ages participate every year. Why: You know you want to. You know you need to! How: Come by bi-, tri-, uni-, quadri-, or any other kind of human-powered cycle, whether upright, recumbent, road, hybrid, urban, mountain, folding, tall, tandem, cruiser, or any other style. 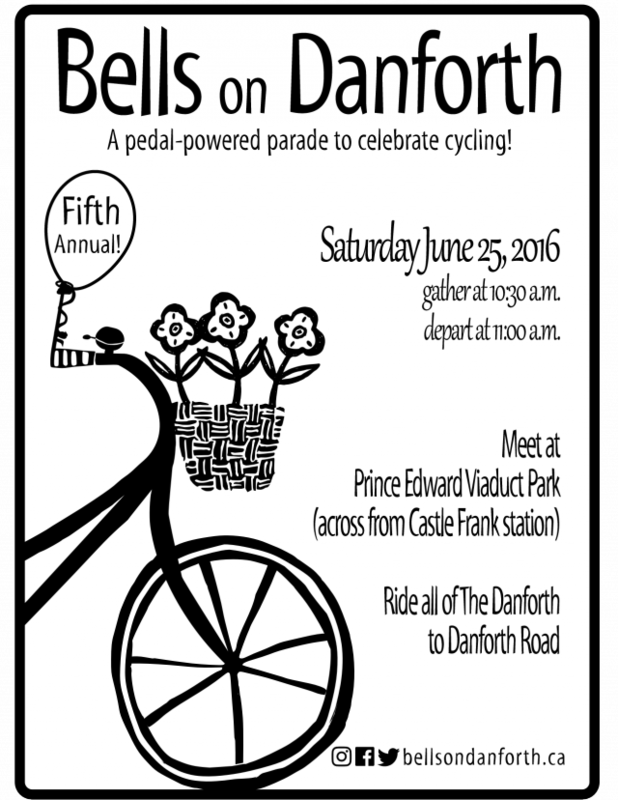 Join us this Saturday for the fifth annual Bells on Danforth, a pedal-powered parade to celebrate cycling! 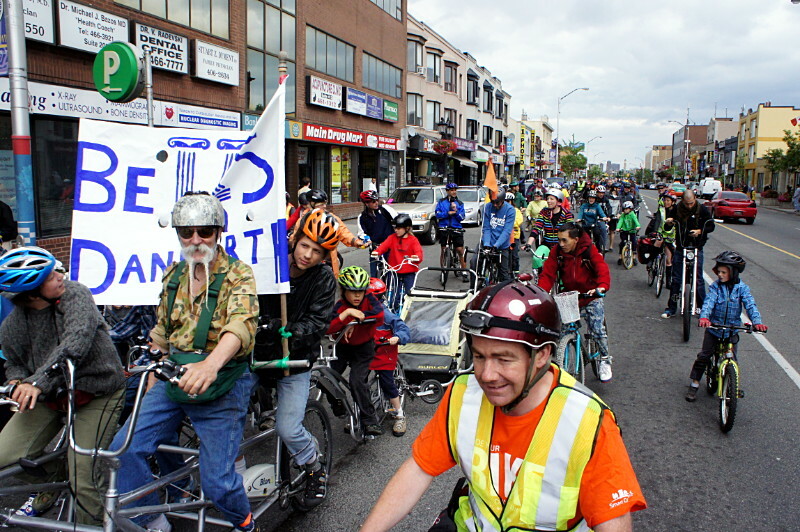 More than 500 people riding all manner of bikes, took over Danforth for last year’s biggest-ever edition. Let’s go even bigger this year! Meet across from Castle Frank Station at 10:30 am on Saturday, June 25. See the Bells on Danforth website for full details. Our penultimate Thursday Night Ride for 2013 takes us into Rosedale and Moore Park on our way to the quiet trails of Mount Pleasant Cemetery before returning to East York via the Don Valley Brick Works. Meet at the East York Community Centre at the corner of Pape and Torrens Avenues on Thursday, June 27 at 6:15 p.m. The ride leaves at 6:30 p.m. rain or shine, but will be cancelled if thunderstorms are likely. Email info@29bikes.ca before 5:00 p.m. on Thursday if you want confirmation of the status of the ride; final determination will be made by 5:30 p.m. The final route may change depending on weather, surface conditions, construction, and other factors. TTC fare in case you get tired and need a lift home. Contact us if you have any questions, and we hope to see you on Thursday. 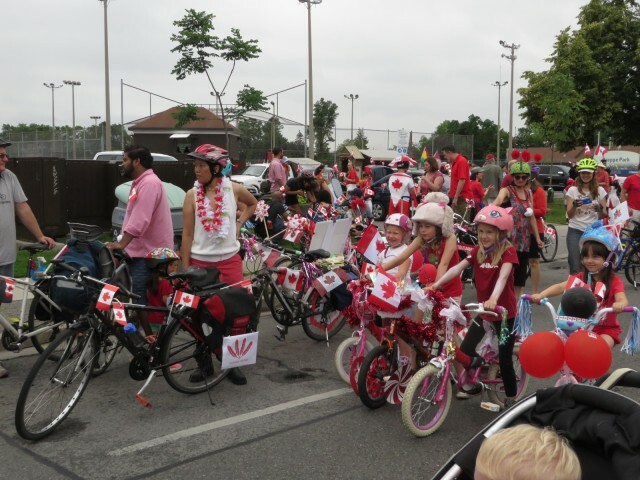 Ward 29 Bikes is riding in the East York Canada Day Parade on July 1 once again this year and cyclists of all ages and abilities are invited to join us. The parade is a great opportunity for new and experienced cyclists alike to ride in a fun, friendly, and safe atmosphere while impressing thousands of spectators with your ability to balance on two wheels at parade speed, turn in circles, and wave. 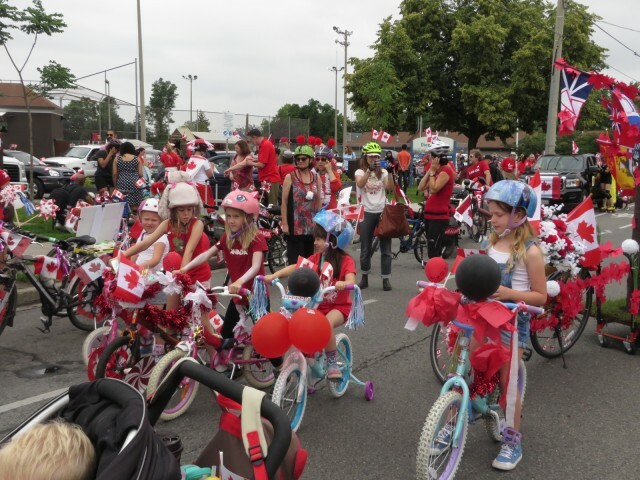 The parade has been run continuously in East York for more than 50 years and features numerous community organizations, floats, a motorcade, marching bands, and—for the fourth year—a growing band of cyclists who want to show how much fun riding around the city can be. 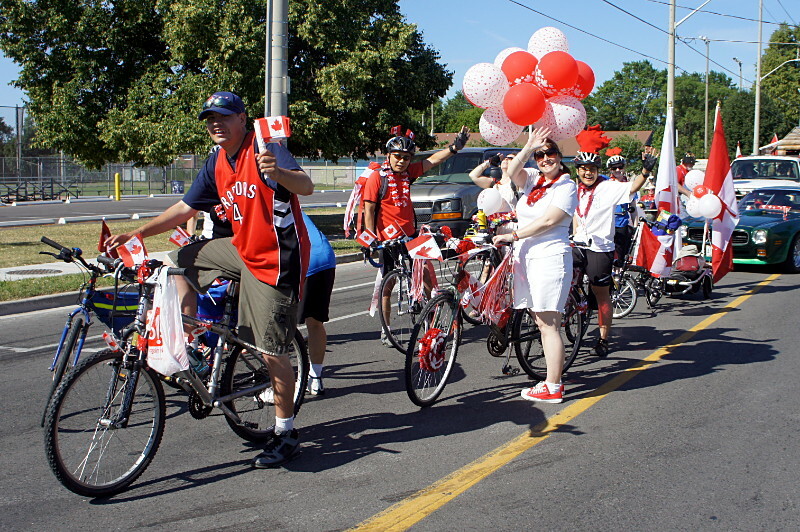 The parade winds slowly through the streets of East York to the big Canada Day party in Stan Wadlow Park. There’s only one thing that’s more fun than watching a parade: being in a parade! So bring yourself, your family, your friends, and your neighbours to the parade starting point (see the map below) on July 1 and get ready for the most fun you can have on two wheels. Wear red and white or Ward 29 blue. We’ll provide bike decorations, or you can decorate on your own if you want to compete in the best dressed bike contest. Contact us if you’d like to participate this year or if you have any questions about the parade. Meet at 8:30 a.m. (no later than 8:45), Monday, July 1, 2013. The parade leaves after 9:00. We start at the East York Town Centre (formerly Thorncliffe Mall), in the parking lot in front of Target. The parade arrives at Stan Wadlow Park around 11:00 a.m. The party and midway continue until fireworks at dusk. Wear clothing appropriate for the weather. Don’t forget sunscreen and a water bottle. Our 2013 Thursday Night Ride series continues this week with a ride down to the Beach and along the Martin Goodman Trail to Cherry Beach before returning to our neighbourhood for refreshments. Meet at the East York Community Centre at the corner of Pape and Torrens Avenues on Thursday, June 13 at 6:15 p.m. The ride leaves at 6:30 p.m. rain or shine, but will be cancelled if thunderstorms are likely. Email info@29bikes.ca before 5:00 p.m. on Thursday if you want confirmation of the status of the ride; final determination will be made by 5:30 p.m.
Our 2013 Thursday Night Ride series continues this week with a tour through Taylor Creek Park and Warden Woods. This week’s ride takes us through several East York and southwest Scarborough parks and neighbourhoods, and includes a hidden treasure along the way. As always, we’ll return to an East York-area ice creamery for dessert and socializing. Meet at the East York Community Centre at the corner of Pape and Torrens Avenues on Thursday, June 6 at 6:15 p.m. The ride leaves at 6:30 p.m. rain or shine, but will be cancelled if thunderstorms are likely. Email info@29bikes.ca before 5:00 p.m. on Thursday if you want confirmation of the status of the ride; final determination will be made by 5:30 p.m.
Our 2013 Thursday Night Ride series kicks off with a fun ride up the Don Valley to Edwards Gardens. We’ll cycle through the Bridle Path neighbourhood, Sunnybrook Park, and Leaside on our way back to East York for a post-ride ice cream. Meet at the East York Community Centre at the corner of Pape and Torrens Avenues on Thursday, May 30 at 6:15 p.m. The ride leaves at 6:30 p.m. rain or shine, but will be cancelled if thunderstorms are likely. Email info@29bikes.ca before 5:00 p.m. on Thursday if you want confirmation of the status of the ride; final determination will be made by 5:30 p.m.
Once again, several local cycling advocacy groups are joining forces to bring you the second annual Bells on Danforth bike ride. This family-friendly event to celebrate cycling on the Danforth takes place on Saturday, May 11, the day before Mother’s Day. 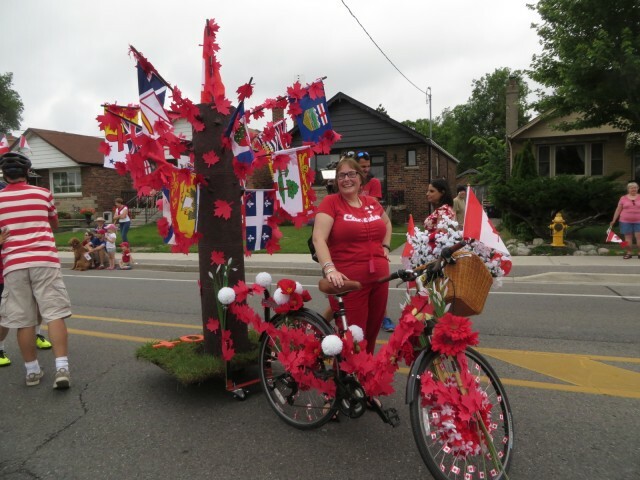 Our pedal-powered parade starts at East Lynn Park (on Danforth, one block west of Woodbine) at noon. We’ll ride to Queen’s Park, where we’ll join groups from Bells on Yonge, Bells on Bloor, and Walk Toronto at the Cycle and Sole rally. Join us at the ride, and watch the Bells on Danforth site for more information. 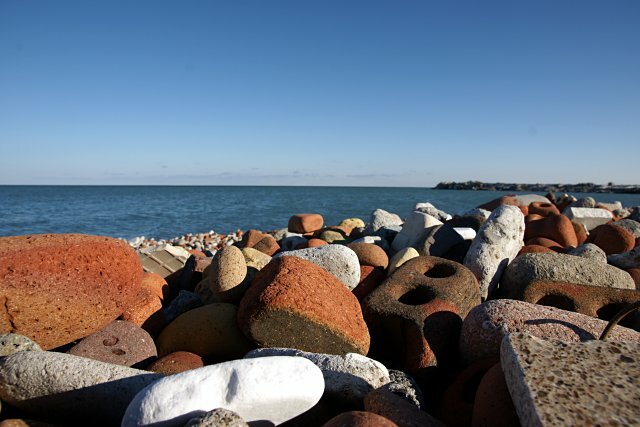 Brick beach on the Leslie Street Spit. The trails are a little smoother than this. Our Thursday Night Ride series this past June was so popular that we’ve decided to run a Sunday morning autumn ride to the Leslie Street Spit next Sunday, October 28. Meet at the East York Community Centre at the corner of Pape and Torrens Avenues on Sunday, October 28 at 10:45 a.m. The ride leaves at 11:00 a.m. rain or shine. This ride will take us through the streets of Riverdale and the Port Lands to the Leslie Street Spit, where we’ll continue all the way out to the lighthouse at the southern tip. Fall colours and cooler temperatures make autumn a wonderful time to cycle on Toronto’s streets and trails. It can be chilly on autumn mornings, so we’ll be bringing a supply of warm (non-alcoholic) apple cider for riders who join us. Bring a snack for yourself and dress in layers if it’s cold. Remember that it may be a few degrees cooler by the water than it is in the rest of the city. Contact us if you have any questions, and we hope to see you next Sunday.